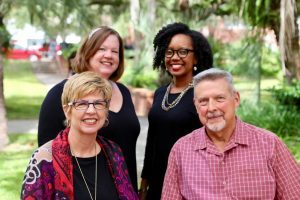 The CEEDAR Center leadership team, from UF’s nationally ranked Special Education program, consists of Meg Kamman (pictured clockwise from top left), Erica McCray, Paul Sindelar and Mary Brownell (center executive director). GAINESVILLE, Fla.—The successful five-year launch of a University of Florida-led effort to help states across the nation vastly improve teaching and school leadership for students with disabilities has received a $21 million boost to further strengthen and expand the ambitious program for another five years. By 2023, after a decade of collaborative work with education leaders and agencies in multiple states, UF special education researchers say the impact of the intensive educator-prep reform activities will be evident in at least 30 participating states. The project got its start in 2013 when the U.S. Department of Education awarded $25 million to the UF College of Education to create a national center that would partner with public education systems and university teacher and leader preparation programs in five new states each year through 2016. The ongoing charge of the resulting center–now more than 20 states strong including Florida—has been to help states retool and strengthen their standards and methods for preparing, licensing and evaluating effective teachers and school leaders serving students with disabilities. A team of faculty researchers from UF’s nationally ranked Special Education program heads the center, dubbed the Collaboration for Effective Educator Development, Accountability and Reform, or CEEDAR Center for short. UF’s back-to-back CEEDAR grants were awarded by the federal Education Department’s Office of Special Education Programs. The researchers call the extended version of the center CEEDAR 2.0. The success of the first effort was key to obtaining the new funding, according to Mary Brownell, CEEDAR Center executive director and a UF professor of special education. “With new funding support we aren’t just reloading,” she said. “We’re taking our successes and lessons learned in our first five years and scaling up our existing reform and improvement programs in our 20 original states. In the United States, 60 to 80 percent of students with disabilities spend time in general education classrooms, according to Brownell, underlying the need to improve teaching and leadership in all schools. She said the CEEDAR program’s growth over the next five years will involve a mixture of original and new state members. She said several states are already contacting the center and asking to participate. Besides Brownell, members of the center’s leadership team from UF’s Special Education program—which is ranked fifth in the nation by U.S. News & World Report—include co-directors Erica McCray, an associate professor, and assistant scholar Meg Kamman, who was the project coordinator under the first CEEDAR grant. Also, Lynn Holdheide of the American Institutes for Research (AIR), one of the world’s largest behavioral and social science research organizations, is the center’s director of strategy and operations. AIR is a primary national partner in the project along with the Council of Chief State School Officers. Brownell said center staff members are providing “technical assistance”—or specialized advice and customized support—to help states enact new standards and practices for licensing and evaluating their teachers and school leaders, and organizing research-driven professional development and networking programs for the educators. Brownell said a major accomplishment of the original CEEDAR program was galvanizing all educator-prep program stakeholders in individual states to craft a shared vision and goals. She said the stakeholder groups include state and district education agency leaders and staff, university faculty in general and special education teacher-prep programs, and higher-education scholars in educational administration and leadership. CEEDAR staff also are helping states align their revised educator-prep policies and practices with key state and national education reform initiatives and standards. Brownell said the CEEDAR strategy places heightened emphasis on exposing all students to research-proven teaching practices in the vital subject areas of reading, writing and mathematics. Instruction is based on a teaching framework that provides multiple levels of academic and behavioral support for all learners—at struggling or advanced levels. CEEDAR also stages professional development webinars and workshops and hosts a website offering numerous multi-media resources and a Facebook-style “wall” for member-networking and sharing ideas. While the University of Florida team leads the overall CEEDAR progam, UCF is one of three higher education institutions in Florida partnering with the center in the state’s special education reform effort, along with the teacher prep programs at St. Petersburg College and the University of West Florida in Pensacola.